Water stops are largely a luxury at most 5k races. For the canine competitors at the Lost Dog 5k Friday night, they were a necessity. When the evening weather Friday was markedly warmer than a week before, runners — with two legs or four legs — knew they’d have to adjust their expectations and race strategies. The second of the four-race series in August benefiting the Lost Dog and Cat Rescue Foundation saw 115 repeat runners from the first week. The out-and-back course on the Four Mile Run and W&OD trails included strips of natural surface along the paved trail, perfect for paws. This week, 60 dogs raced. 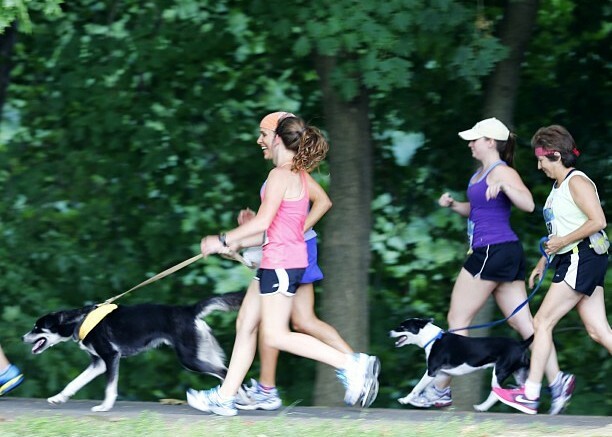 Runners were welcome to run with socially-adjusted dogs, and many did. Runners without dogs of their own had the opportunity to rent a pup for the race. Cerbi took a few detours into the creek alongside the trail, to cool off, with owners Maari Hanson and Jason Soules in tow. “He gets along great with other dogs, if only for five seconds before he gets bored,” Soules said. Hanson said Cerbi has been the couple’s training partner for a while. Greg Russell, of Centreville, took his dog, Taylor, to her first race, and it went well. Russell is training for the Marine Corps Marathon. Taylor didn’t get in before the race filled up. She just started running a year ago and just got back into racing after finishing rehabilitation following foot surgery. Sara Fiorini, of Alexandria, agreed with Lally’s rough assessment, following the gift-like weather the first week. She runs to stay in shape for three different soccer leagues. Not everyone suffered from the uptick in heat index. Overall winner Claire Hallissey of Arlington actually dropped six seconds from a her win on the cooler day, running 17:20. She took the lead at the turnaround and put 34 seconds on her closest pursuer in the second half. She went on to claim the top overall spot two days later at the DC Road Runners cross country three mile in Bethesda in 19:36. Greg Hermanson, of Woodbridge, has been volunteering for the Lost Dog Foundation for more than 10 years, but he just started running last year.